Backing up your WordPress blog regularly is a necessary safety measure to securing your files and database. There are definitely numerous backup methods out there but I prefer one that is automatic and regular. Backing up to the cloud is definitely a preferred choice for me as it will even be easier and less demanding and probably cheaper. With free cloud storage services all over the internet, backing up your WordPress to the cloud became even easier. Today I am going to show you how you can automatically backup WordPress site/blog to the cloud (Google Drive) using Google Drive for WordPress plugin. Google Drive is a cloud storage service by Google that offers free 5GB storage space for a free user, 25GB for just $2.49 /month and 100GB for $4.99 /month etc. 5GB is enough space to backup WordPress site. Google Drive for WordPress is a free WordPress Plugin used to backup WordPress files and database with Google Drive. This plugin performs excellent backup for your WordPress files and Mysql database with Google Drive and this process is automatic as well. Download and activate the plugin on your WordPress dashboard. 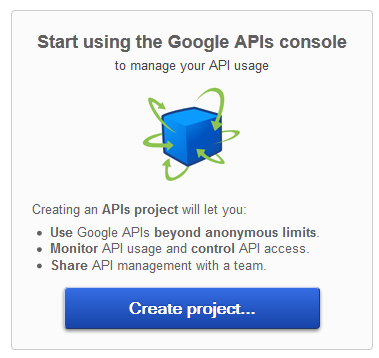 On activation of this plugin, a “Configure Google” tab will be added to your dashboard as illustrated on the image below. Then click on the Configure Google from your WordPress dashboard to configure the settings. You will then need to head over to Google API Console to obtain your Client ID and Client secret required by this plugin to access this Google service. Since all Google services use the same authentication id, use your Gmail account (if you already have one) to login to the Google API Console. Click on the “Create Project” button to create a new project. 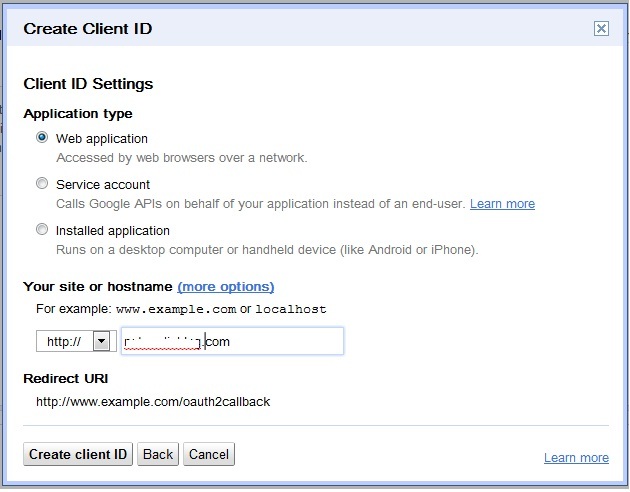 Then click on the “API Access” to create an OAuth 2.0 Client ID. Fill the form appropriately just as I’ve filled mine. Then click “Next” , choose “Web Application” then fill in your site details on the space for it. 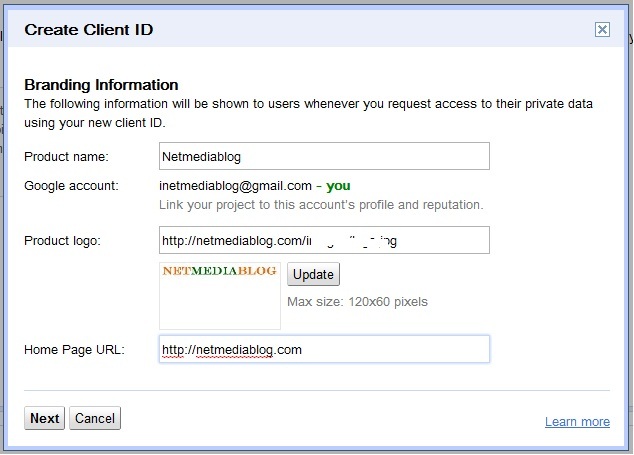 Then finish by clicking the “Create client ID” button. Your Client ID and Client secret will be displayed for you, copy it back to your WordPress Dashboard and paste it where appropriate and click “Allow Access” button. You may have an error 400, I got around it by clicking on the “Edit settings” on the Google API Console page where I just copied my Client ID and Client secret from. where your-domain.com is your domain url. Then go back and click on the allow access button again. On allowing access you are redirected back to your dashboard. Now you can configure the backup settings, manage database, manage files, schedule backups etc. Now i hope you can backup your WordPress site easily using the method i explained here. If you find above post on “Backup WordPress to the Cloud with Google Drive for WordPress” interesting and useful, please share this post with your friends using the share tools on the left hand side of the browser or the ones under this post. Please if you haven’t liked our Facebook page simply click on the “Like” button on the right hand side of the browser. You can also follow us on Twitter right under the Facebook page. I hope you read my blog post on “Cloud Sync services: Comparing Sugarsync, Windows live mesh and Dropbox“. I never thought of this. But will it make complete backup? E.g your comments,image so when uploading your backup you wont lose a thing just like backupbuddy? It will backup even your database….yes it will perform a complete backup of your WordPress.